If you’ve ever dreamt of living in a castle, then this could be the ideal UK holiday for you! Last month, I visited Taunton in Somerset, and stayed at the gorgeous Castle House apartment, thanks to Classic Cottages. It’s a self-contained apartment within Castle House, part of Taunton Castle, which dates back to the 12th century. Of course, that means that it comes with its own little quirks, like uneven floors and crooked walls. But all of that definitely adds to its character as well! And if you are worried that sleeping in a castle means cold nights and going without internet, don’t worry. Castle House is a historic apartment that comes with plenty of mod-cons. Taunton is the county town of Somerset, and lies just a few miles from the M5 Motorway. It also has a train station, so it’s easy to get to. Taunton Castle was taken under the care of the Somerset Archaeological and Natural History Society in 1874, and has been renovated throughout. Some photographs of the renovation process can be seen on the apartment walls. The apartment sleeps seven people in four bedrooms, and there is room for two cots if you wish to bring them with you. There is central heating throughout the apartment, and free wifi is provided. Free parking for one car is available in the Castle Hotel car park, other cars can be parked at cost. And if you’re looking to explore the local area, the information guides and books provided will help you to plan your stay. You can rent Castle House through Classic Cottages for full weeks or for short breaks – click here to visit the Castle House page on the Classic Cottages website. Let me take you on a photo tour around the apartment. 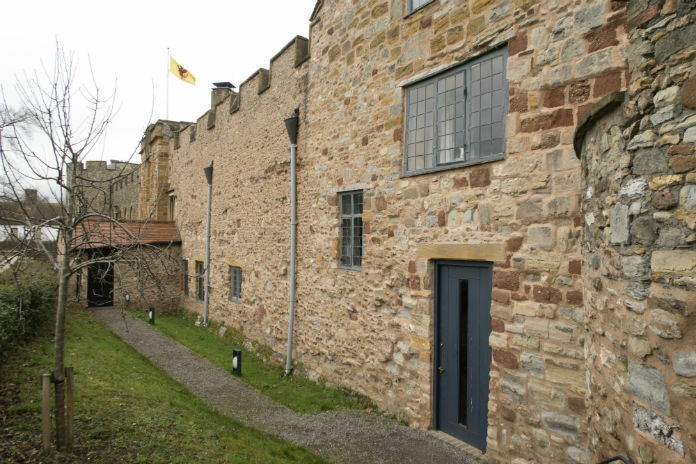 You enter Castle House through its own entrance on the ground floor of Taunton Castle, and head up a flight of stairs to the entrance hall. This then leads you into my favourite room in the whole apartment, the Tudor Hall. It’s hard to do this room justice in photographs, because it’s just so much bigger and grander in real life. The high ceiling, stone fireplace and windows all give a hint of what it might have been like to live in Taunton Castle in centuries past. There are comfy sofas to settle down on for the evening, and although you can’t light a fire in the fireplace, candles are provided to give a cosy effect. There’s a TV, selection of DVDs, and a CD player in the room for entertainment. There’s also a door which leads through to the Castle tower, but unfortunately that remains locked. You can request a tour over at the Museum of Somerset, which also has its home at Taunton Castle. Although Castle House lies in the middle of the town, there was less noise than I thought there would be. And I was expecting a room of this size to feel chilly at times, but Castle House apartment stays very cosy even at night. The heavy curtains at each window help to block out light and noise and keep in the warmth. As I mentioned above, Castle House has four bedrooms which can sleep seven people. Two bedrooms lie on the first floor of the apartment, and two lie up a further flight of stairs on the second floor. Ollie claimed the single bedroom for himself, which is just down the corridor from the Tudor Hall. It’s a cosy little room which has exposed beams in one of the walls. Each of the bedrooms is provided with crisp white hotel standard bed linen and plenty of fluffy towels. They also all have their own character and style of decor. The double bedroom is also on the first floor, and has a very sunny aspect. Even before we arrived at the apartment, Lyle was eager to claim this room for the weekend. You might notice that he managed to stash his suitcase under the bed before I got in to take photos. That’s how keen he was to get first dibs on this bedroom! The other two rooms lie at the top of the apartment. I really love this twin bedroom, which has a very calm and peaceful feel about it. The rooms in Castle House all have antique furniture in them, which adds to the feeling of history about the apartment. Mark and I slept in the apartment’s main bedroom with its dramatic four poster bed. And as with the Tudor Hall, it’s hard to convey how big this room really is. I’m only showing about a third of the room in the photograph above. There was also a large wardrobe, dressing table and a table and chair at the other end of the room! With such comfortable and cosy beds, we all found that we slept very well at Castle House. In fact, it was pretty difficult to get the teens out of bed early in the morning for our trips to Hestercombe House and West Somerset Railway. Castle House lies right in the middle of Taunton, so there’s plenty of choice when it comes to eating out. But if you prefer to self-cater, then the apartment has pretty much everything that you could need, starting off with this welcome tray of tea, coffee and biscuits! The well-equipped modern kitchen has a gas oven and hob, fridge and freezer, dishwasher and washing machine. There’s also a toaster, microwave and even a dock for your iPod. This room has a large window that looks out over a kitchen garden. This would be ideal to sit in with a meal or a glass of wine on a summer evening. Unfortunately it was a little too cold to do this when we visited in February! The cupboards are packed with plenty of crockery, cutlery and pretty much any kitchen tool that you might need. And a supply of washing up liquid, washing powder and dishwasher tablets meant I didn’t have to nip out to the supermarket as soon as we arrived. Incidentally, the nearest supermarket was only a 3 minute walk from the apartment – it’s very convenient! It did take us a little while to locate the cutlery and glasses, but that’s because they’re all beautifully stored in the apartment’s dining room. The apartment’s dining room has a large table that seats eight people. So if you choose to eat ‘at home’ during your holiday, you can dine in style. As with the other rooms, it’s decorated with antique furniture and curiors, and artwork on the walls. If you prefer to eat out, then you have plenty of choice from Taunton’s many cafes, bars and restaurants. The nearest pub is just 100 metres or so from the apartment’s front door, and we also enjoyed a particularly good breakfast at Brazz, which is just around the corner from Castle House. There are two bathrooms in Castle House apartment, plus a separate loo as well. One bathroom is on each floor, which makes it pretty convenient if you’re travelling as a large group. The second bathroom is on the same floor as the Tudor Hall, and that has a really powerful rainfall shower. As with the bedrooms, the fact that you’re staying in a period property means that there are some quirks in the bathrooms. But during our stay, we grew used to the crooked floors and uneven walls, and somehow it makes Castle House feel very homely. Castle House is quite unlike any holiday home that I’ve stayed in before. If you’re used to modern holiday apartments, a stay at Castle House might be a shock to the system. But we absolutely loved our Castle home from the moment we got there. The original floorboards, low doorways and stone walls give the apartment masses of character. And the apartment is very spacious – there’s plenty of room even for seven people, so it’s perfect if you’re travelling with extended family or as a group of friends. And I was really surprised how homely the apartment feels, even though it has obvious grandeur as well. I never quite got over that dramatic ceiling in Tudor Hall. In fact our only real quibble during our visit was how far the kitchen is from the Tudor Hall. I actually counted steps at one point, because it felt like such a long walk. It took me 50 steps to cover the distance from my cosy seat in Tudor Hall to the fridge in the kitchen! But that’s the price you pay for living in a castle, even if it is just for the weekend. If you’re looking for something out of the ordinary for your next UK holiday, then Castle House could be the holiday home you’ve been dreaming of. You can rent Castle House for full week stays, or for short breaks, though Classic Cottages. Prices start from £577 per week, which works out at great value if you’re travelling as a group of 7. Prices correct at time of writing – click here to see full property details and check current prices. Classic Cottages have over 1100 holiday homes available across the South of England, from Cornwall to the Isle of Wight. Their portfolio includes modern apartments, dog friendly cottages and seaside holiday homes. Thanks to Classic Cottages for our wonderful Castle holiday in Taunton!